Coastal Club, Lewes townhouse villa available for rentals, off-season rentals, long term rentals and is located in Coastal. Club resort near Lewes Beach, Cape Henlopen State Park and Rehoboth Beach, Delaware. Also homes for sale. 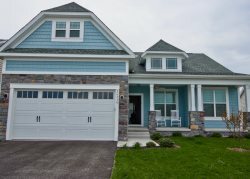 3 BR, 2.5 Baths * Sleeps * New Luxury Villa Home w new furnishing at Coastal Club Resort in Lewes! 43/49: Walk the 3.5 Mile Eagle Trail at Coastal Club. Bedroom Layout: The home has 3 BR, (The Master Bedroom Suite is on the main floor and has a King bed w premium mattress. There are 2 additional bedrooms upstairs that share a full bathroom. One of those bedrooms has 1 queen bed and the other bedroom has 2 twin beds. The upstairs loft features a 2nd gathering area with a large HDTV and a sofa that converts into a queen bed. The bedrooms and loft all have direct access to a full bathroom upstairs. There's a very large and lofted family room /great room with a big HDTV plus an additional powder room 1/2 bath on the main floor. RECREATIONAL PASSES: You don't have to purchase any passes if you don't want to. Purchase only for those who'll be using the resort amenities. Passes give you access to the resort amenities including the pools (New Hot Tub and Indoor Pool w Swim Lanes for 2018) , clubhouse, tennis, fitness gym, free coffee and hot chocolate. Children are not allowed to use the pool tables unsupervised. The cost for passes during 2018 was $12 for single day pass per person or $40 per weekly pass per person. Children under 12 are FREE when accompanied by adults who have purchased passes. Coastal Club is an extraordinary resort destination, situated around a 42-acre nature preserve with 5-acre pond, bordered by rolling woods and offering amenities unlike any other community in the Lewes and Rehobotharea. Coastal Club puts you moments from the beach and close to everything you love about beach life. You can easily head over to RehobothBeach for the day, or enjoy fishing on the waterways and ocean. You can also explore Cape HenlopenState Park or head over to nearby Route 1 for the area’s best shopping. Local eateries include Agave Restaurant, Striper Bites, The Buttery and Touch of Italy. COASTAL CLUB RESORT: Imagine vacationing in a community so rich with amenities that you never want to leave! Located just moments from downtown Lewes, Coastal Club is an extraordinary resort destination, situated around a spacious nature preserve with a peaceful pond, bordered by rolling woods. Begin your day enjoying the sights and sounds of nature along the three-mile Eagle view trail. Enjoy a game of tennis or bocce ball with family and friends. Grab a cup of coffee at the Lighthouse Club, then take a dip in the incredible infinity pool (and new indoor Hot Tub and Indoor Pool) and enjoy a cocktail at the only swim-up pool bar in Delaware. No matter what you’re looking for in a resort community, it’s all right there at Coastal Club!